“We’re going to play with makeup,” Samantha Spencer said to a group of 15 in the Student Union Building at Dal this week. The room responds with a giggle, and the first volunteer sits down at the front of the room with a sheet wrapped around their neck. Makeup and brushes are spread across a nearby table, and Spencer narrates her feminizing makeup tutorial with application and product tips. Her hands don’t stop moving for an hour and a half as she blends foundations, demonstrates contouring and applies mascara. 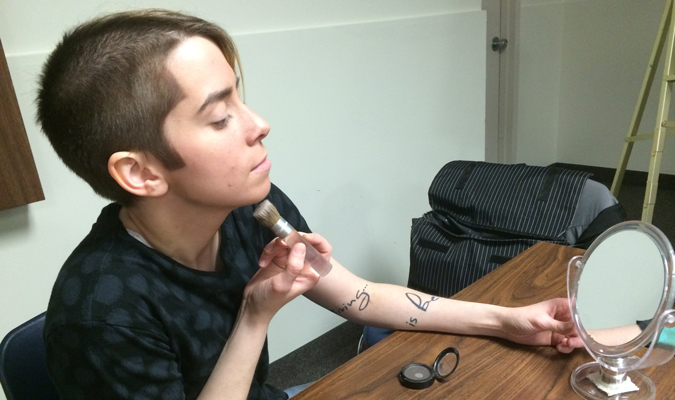 It’s the third annual workshop that DalOUT, the LGBTQ student society at Dal, has hosted for gender expression through makeup. There are two tutorials: one to demonstrate feminine makeup, the other to go through a masculinizing makeup routine. Spencer has been doing the makeup tutorials for the workshop since it started. In 2010, she graduated from Eastern College’s eight-month makeup program. Spencer transferred to Dal, where she studies sociology and gender and women studies, and became the DSU representative for DalOUT in 2012. She said the workshop started after a Dal student requested it. Clark MacIntosh did the second tutorial for masculinizing makeup. “It took me six months of fiddling with makeup before I thought that I felt comfortable enough going out in public or onstage with it,” they said. 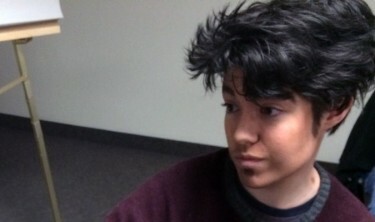 MacIntosh started performing as a drag king two and a half years ago, and often wears masculinizing makeup day-to-day. When they started looking for examples of masculine makeup, “it was a lot of trial and error and YouTube,” MacIntosh said with a laugh. MacIntosh’s demonstration focused mainly on properly layering foundation, and using straight lines. They said straight lines are more typically seen in the facial structure of cis men, whether it be the hairline or sideburns. “Straight lines tend to be read more as male and round tend to be more read as feminine,” they said. “I identify as gender fluid, so really no one ever gets my gender right that often, because folks tend to assume male or female. But especially when I’m feeling more masculine and people misgender me or misread me as female, it can kind of be jarring sometimes. “It’s this really awkward, strange feeling where I don’t feel right in my body right now. And that happens all the time, everyday. When you get to at least create your own gender expression, whether it’s through your clothing, makeup, binding, whatever, at least it helps make you feel more comfortable that people are going to read you for how you choose for them to read you. Felix Reynolds agrees. On Wednesday, Reynolds was MacIntosh’s model for the masculinizing tutorial. And the events are for everyone, no matter how they identify. “Everyone’s learning a new skill. Just to kind of see what drag kings or trans guys have to go through, or even if you want to wear makeup like that for cosplay, for instance. It’s a good learning experience. You know you can never go wrong with makeup tips, whether you wear makeup or not, because it’s a lot of skin care, too,” Reynolds said. MacIntosh’s advice for people interested in trying gender expression through makeup? During the makeup workshop, MacIntosh was asked where they had good experiences buying makeup in Halifax. MacIntosh recommends M.A.C. and Sephora at the Halifax Shopping Centre, and they always go to the Shoppers on the corner of Robie and Almon Street.